Kitchens are definitely one of the most renovated areas of any home. Many homeowners see their kitchens as the heart of their homes, making aesthetics and functionality highly prioritized. In order to achieve that desired look of a custom cabinetry or custom kitchen, adding custom stained glass can drastically transform your existing space. 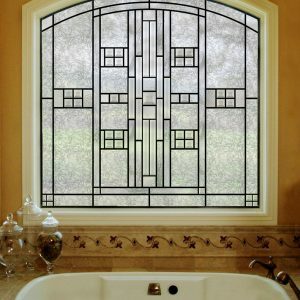 Custom stained glass is a wonderful investment for kitchen windows, cabinetry, pantries, and more. Kitchen windows can brighten up your space making it easier to cook, lowering lighting costs, and add a warm, inviting feel to your kitchen. Window coverings obstruct natural lighting and can lend an outdated look to an otherwise contemporary kitchen. Stained glass offers the privacy any home cook will appreciate without compromising natural sunlight or sacrificing aesthetics. Custom stained glass can be designed in any style complementing contemporary and traditional decor. Updating your kitchen windows with stained glass also enhances curb appeal and property value. Custom stained glass is the perfect addition for kitchen cabinets, pantries, and any built-in displays. By investing in stained glass, you can really promote that custom cabinet look by simply replacing a few doors. Stained glass makes a great display option for glasses, dishes, and more in your kitchen. 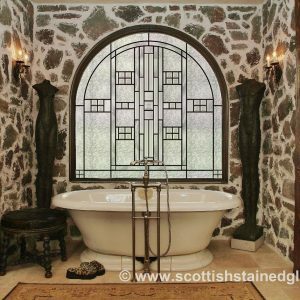 With leaded glass or traditional stained glass, homeowners can pick the visibility level they desire. Pops of color can add eye-catching touches that complement the rest of your kitchen design. Kitchen renovations can be one of the most expensive investments, making stained glass investments a great, smaller project for homeowners. Whether you’re custom designing stained glass for your cabinets, pantry, or kitchen walls, all you’ll need is the dimensions in order to get started. Our custom builder is highly intuitive and easy to use, making custom designing convenient for any homeowner. If there is a certain aesthetic you’re looking for but can’t quite achieve with our custom builder, please contact us! One of our stained glass artisans would be more than happy to work directly with you in creating your custom stained glass masterpiece. 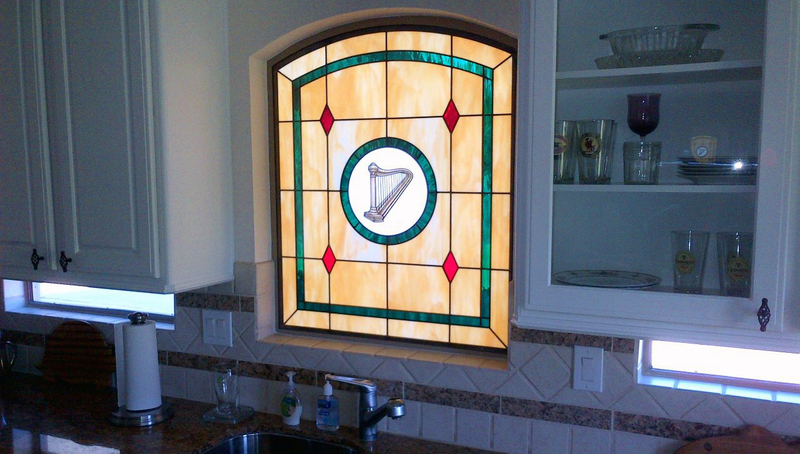 For more information regarding custom stained glass for your kitchen or cabinets, please contact us!